It’s still too early to be sure that last month’s pullback in shares is over but we remain of the view that it was not the start of a deep bear market and that the trend in shares remains up. October was a bad month for shares with global shares losing 6.8% in local currency terms and Australian shares losing 6.1%. It’s possible that following top to bottom falls of 9% for global shares, 11% for Australian shares, 21% in emerging markets and even 31% in Chinese shares we have now seen the low in the share market rout. Shares were due a bounce and from their October lows and Australian shares have risen around 4%. But it’s impossible to be definitive and with the worry list around US interest rates, trade, politics, etc, there could still be another leg down. However, our view remains that recent turbulence in share markets is a correction or a mild bear market at worst (like 2015-16) rather than the start of a deep bear market like the global financial crisis. This note reviews the key recent worries for shares and why they are unlikely to be terminal. The US economy is very strong as evident by consumer confidence at an 18-year high, unemployment at a 49-year low and strong economic growth. 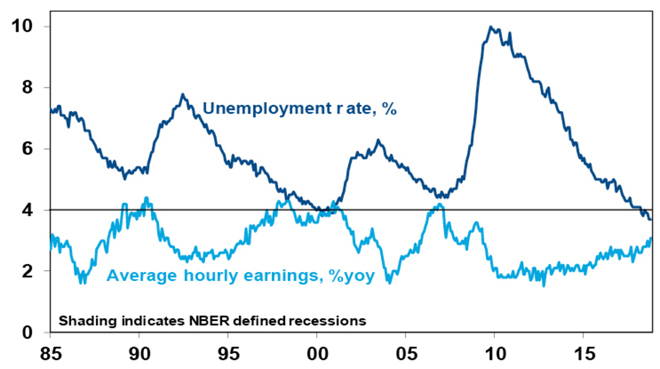 With spare capacity being used up wages growth is edging higher as evident in the next chart. Against this backdrop it makes sense for the Fed to continue the process of returning monetary policy and interest rates to something more normal. Naturally, the ongoing removal of monetary stimulus in the US creates consternation and has been periodically ever since former Fed Chair Bernanke started talking about slowing or “tapering” quantitative easing in 2013. In short, investors continue to fear a return to the GFC and so any move to remove monetary support creates periodic bouts of fear. Several points are worth noting about this though. First, the Fed can afford to remain gradual in raising rates. Inflation is at the 2% target, wages growth is a long way from the 4% plus level that preceded past recessions and productivity growth is rising so this will keep growth in unit labour costs down. Meanwhile, intense competition and technological innovation are also continuing to help keep inflation constrained. Fourth, while Trump’s comments expressing optimism about a deal with China should be treated with scepticism as they came just before the US midterm elections, they do highlight cause for optimism that a deal will be reached eventually. At least Trump and Xi are talking and Trump’s optimistic comments ahead of the midterms effectively tells us that he is aware that the trade issue is harming the stock market and potentially the economy. The latter in turn suggests that he wants a deal well before he faces re-election in 2020. So, while it may be premature to expect a deal when Xi and Trump meet later this month, a deal is likely well ahead of the 2020 elections. With China already lowering tariffs, improving IP protections and softening joint venture requirements the outlines of a deal are starting to become apparent and Chinese Vice President Wang has indicated China is ready to negotiate with the US. On average the US resident has lost 29 House seats in his first midterm election. Clinton lost 54 and Obama lost 63. Trump looks to have lost around 34 but only needed to lose 23 to lose control of the House so what has happened is not unusual. What’s more the Republicans look to have increased their Senate majority so it’s not all bad for Trump. More broadly, it should be noted that “divided government” is the norm in the US. Perhaps the biggest risk is that Trump takes it personally and ramps up the populism, but if he wants to get re-elected in 2020 (which he does) then he won’t want to do anything that damages the economy and amongst other things this points to cutting a deal with China and getting the tariffs removed. 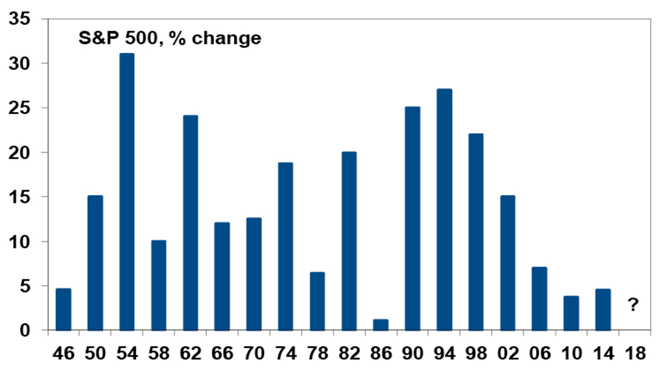 Since 1946 the US S&P 500 has risen in the 12 months after all midterm elections – probably because the president starts to focus on re-election and so tries to boost the economy. Having accounted for a big chunk of US share market gains this year the US tech sector has corrected around 13%, but that still leaves it vulnerable to relatively high valuations (Nasdaq is on a PE of 42 times), sales growth slowing down for some of them and the prospect of increasing regulation. However, we have not seen anything like the tech boom euphoria of around 1999/2000 so a crash like back then is unlikely. Our base case is that the US share market will start to see a rotation from expensive tech to cheap cyclical stocks (with many trading on forward PE less than ten times). Fears that the Eurozone is about to blow apart causing financial mayhem threatening global growth has been with us since the Eurozone crisis that started in 2010. Lately the fear is that populist governments will take countries out of the Euro. This started with Greece in 2015. It was an issue last year but then pro Euro parties and candidates won in various elections. This year it’s been an issue with Italy particularly, as its populist government sought a wider budget deficit, and Germany with Angela Merkel indicating she will step down as Chancellor in 2021. In terms of Italy, there will no doubt be a conflict between the European Commission and Italy over the size of its planned budget deficit but don’t expect it to go too far as the deficit is not outlandish and German and France won’t want to embolden the Eurosceptics in Italy by pushing back too hard. In terms of Germany, the poor performances of the governing German grand coalition parties (the Christian Democratic Union (CDU), the Christian Social Union and the Social Democrat Party(SPD)) at state elections do not signal a threat to the Euro. First, comments by SPD leader Nahles indicate the grand coalition is not under imminent threat. Second, Germany’s budget surplus and falling public debt indicate plenty of scope to provide fiscal stimulus, which would be positive for Germany and the Eurozone and provide an electoral boost for the grand coalition partners. Thirdly, German Euroscepticism is not on the rise. In fact, support for the Euro in Germany has risen to 83% and it was support for the pro-Euro Greens that surprised in Bavaria and Hesse, not support for the Alternative for Deutschland. Finally, a new election is unlikely as both the CDU and SPD have seen a loss of support, so they aren’t going to support an early election. So those looking for a breakup of the Euro can keep looking. In early October world oil prices reached their highest since 2014 with West Texas Intermediate topping $US76/barrel with talk it was on its way to $US100 on the back of strong demand and supply threats including impending US sanctions on Iran. This in turn was adding to concerns about the impact on global economic growth and rising inflation. However, since then the oil price has fallen by nearly 19%. US sanctions on Iran have started but with little new impact as Iranian oil exports had already fallen and the US granted waivers to allow eight countries - including Japan, China, India, Taiwan and South Korea - to continuing importing Iranian oil. The Iranian export cutbacks at a time of threats to production from Venezuela and Libya leaves a now tight global oil market at risk of higher prices, but for now the threat has receded a bit.